With the imminent release of Smash Bros on 3DS tomorrow, a fair many of us will be leaving behind or Wii U Gamepads for greener, but none the more bloody pastures. 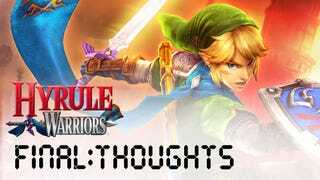 But before we relegate Hyrule Warriors to the shelf (or at the very least till that sweet sweet DLC gets released) lets take this time to remember the good times had, the bittersweet moments, and maybe it's own shortcomings. Please be aware that I'm opening up the discussion for spoilers: You have been warned. Was there something particularly spectacular about it that moved you? How'd you feel about the story? We already know that both Kotaku's Stephen Totillo and TAY's own Unimplied recommend a play. Let's just get some last impressions in before this gem gets tucked away in it's case. It didn't make me want to play Dynasty Warriors. I'm not sure if that was the intention of the developer or not. The characters and call backs were what made the game for me. That's not to say it wasn't fun! I had a blast playing it, but I can't imagine going out of my way to play a Dynasty type game to relive the experience. The grinding and how difficult it is to farm materials is a bit annoying. That said there is a TON of content. After playing through the main story, I find myself making my way through Adventure mode with more content to come. I appreciate that it's giving me ways of getting the materials and levels without repeating needing to repeat levels over and over. Also, dat ending! It was corny and a little contrived but what Lana said about Link and Zelda struck a chord. Full disclosure, Zelda endings always get me.